Science sans conscience n’est que le ruine de l’âme. Knowledge without conscience is but the ruine of the soule. As Love is too young to know what conscience is, so Truth and Genius are too old to know what definition is. Basic research may seem very expensive. I am a well-paid scientist. My hourly wage is equal to that of a plumber, but sometimes my research remains barren of results for weeks, months or years and my conscience begins to bother me for wasting the taxpayer’s money. But in reviewing my life’s work, I have to think that the expense was not wasted. Basic research, to which we owe everything, is relatively very cheap when compared with other outlays of modern society. The other day I made a rough calculation which led me to the conclusion that if one were to add up all the money ever spent by man on basic research, one would find it to be just about equal to the money spent by the Pentagon this past year. In The Crazy Ape (1971). Engineering training deals with the exact sciences. That sort of exactness makes for truth and conscience. It might be good for the world if more men had that sort of mental start in life even if they did not pursue the profession. For centuries we have dreamt of flying; recently we made that come true: we have always hankered for speed; now we have speeds greater than we can stand: we wanted to speak to far parts of the Earth; we can: we wanted to explore the sea bottom; we have: and so on, and so on. And, too, we wanted the power to smash our enemies utterly; we have it. If we had truly wanted peace, we should have had that as well. But true peace has never been one of the genuine dreams—we have got little further than preaching against war in order to appease out consciences. Men who do not know the truth of things try to reach certainty about them, so that, if they cannot satisfy their intellects by science, their wills at least may rest on conscience. In The New Science (3rd ed., 1744), Book 1, Para. 137, as translated by Thomas Goddard Bergin and Max Harold Fisch, The New Science of Giambattista Vico (1948), 56. The moral faculties are generally and justly esteemed as of higher value than the intellectual powers. But we should bear in mind that the activity of the mind in vividly recalling past impressions is one of the fundamental though secondary bases of conscience. This affords the strongest argument for educating and stimulating in all possible ways the intellectual faculties of every human being. 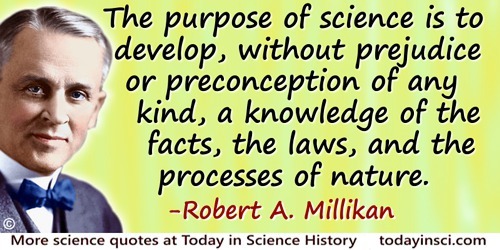 The purpose of science is to develop, without prejudice or preconception of any kind, a knowledge of the facts, the laws, and the processes of nature. The even more important task of religion, on the other hand, is to develop the consciences, the ideals, and the aspirations of mankind. 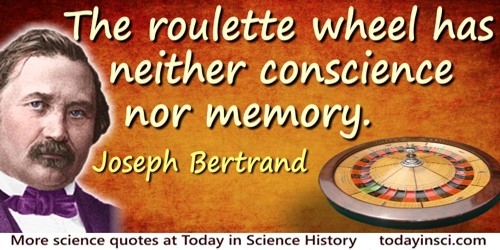 The roulette wheel has neither conscience nor memory. As quoted, without citation, in Émile Borel, Probabilities and Life (1962), 13. There is no duress like one’s own conscience and it is that which makes life so needlessly bitter. Aphorism as given by the fictional character Dezhnev Senior, in Fantastic Voyage II: Destination Brain (1987), 252.